The explosion, and subsequent fire of a long section of the pipeline left at least 96 people dead and more than 200 injured. The extensive police and military operation against the mafias running the theft of fuel, that had begun last Friday, was shaken by the explosion that occurred at dawn on Saturday in a pipeline near the town of Tlahuelilpan, in the State of Guerrero, less than 100 kms from the capital. In the explosion, and subsequent fire of a long section of the pipeline, at least 96 people were killed and more than 200 were injured, many of them with serious burns. The shocking images of the moment of the event, broadcast by television stations, showed dozens of people fleeing the oil pipeline on fire, like they were human torches, and have shocked Mexican society. Mexican President, Antonio Manuel López Obrador, reacted quickly and in an official speech, very early on Sunday morning, announced to the nation immediate support measures, an investigation already under way and the application of a special program, of a social nature and economic, for the localities where the theft of fuel has become a massive activity in many communities, as it is the only means to survive marginality and extreme poverty. 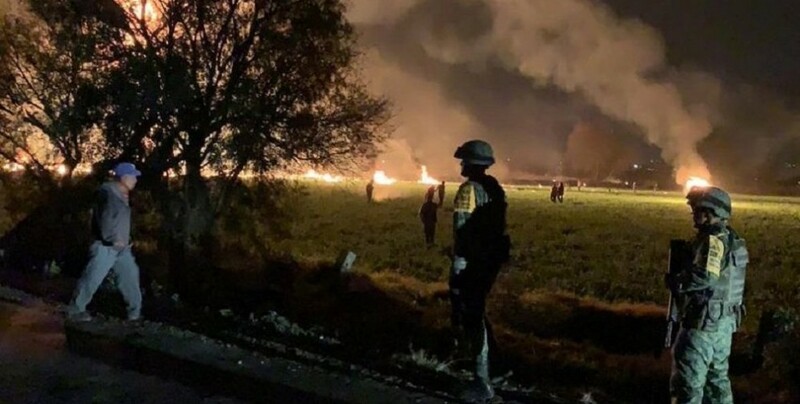 While the operation against fuel theft, known in Mexico as "huachicoleo", aimed at the big mafias that control this lucrative business, the explosion and its consequences have shown that this activity also benefits many impoverished villages settled near the pipelines. Journalist and writer Ana Lidia Pérez, author of four books on the subject, said in an interview, in reference to those who control the business: "The huachicolero came to replace the drug dealer. In many cases it is the same person”. Peréz considered that the attitude of the President, to address the issue also in its social and economic edges for poor communities, was very positive. The Mexican prosecutor's office said it is treating the explosion as a possible intentional act, while various media have criticized military forces that should have protected the pipeline but, unable to contain the hundreds of people participating in the assault, let them pass.